Dr John Watson – World Medical Football Champion! 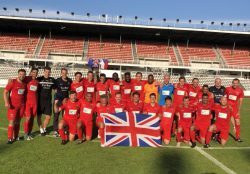 Congratulations to John Watson, a consultant here at the Heartlands HIV Service: as a member of the Great Britain Medical Football Team, he has just won the World Medical Football Campionship in Prague! England may not quite have got to the World Cup Final in Russia, but Team GB did us proud in Prague. Our very own John even set up the winning goal against Australia in the team’s semi-final. Congratulations again to John and the whole team!